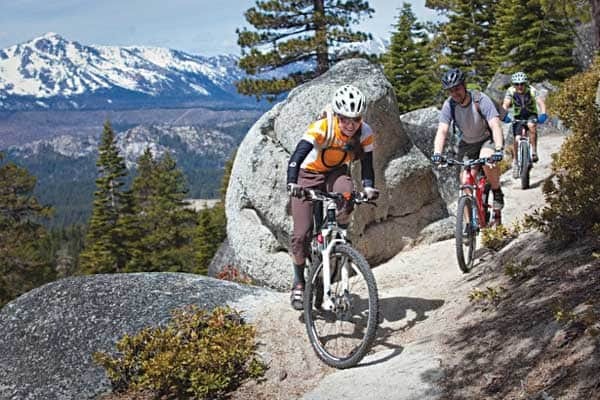 Until recently, I primarily focused my mountain biking excursions close to home in Tahoe City. 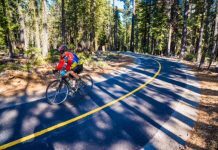 You could find me rolling along the Emigrant Trail, dodging the grasshoppers in Page Meadows or checking out the trails I ski on in the winter at Tahoe Cross Country Ski Area. 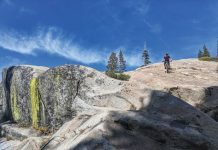 Then a few South Shore friends took me for rides on their local trails, specifically designed for mountain biking and maintained by TAMBA, Tahoe Area Mountain Biking Association. I was enchanted. My favorites are the hairpins and smooth jumps on the Corral and Sidewinder trails. Both are total Goldilocks: not too easy and not too hard, just a total blast to ride. To get there, take Pioneer Trail toward Meyers. Turn left on Oneidas Drive. This turns into a paved, U.S. Forest Service road called Fountain Place. There is a parking lot on the right after about one-quarter mile. This is where the bottom of the trail ends. From here shuttle to the top of the ride on the paved road or ride 3 miles uphill to the start of your dirt riding. The road is a pretty steep ride, but a good warm-up for the downhill to come. Eventually, you reach a junction where the Corral and Sidewinder trails are on your left. From here you have three options: take the Corral Trail, take the Sidewinder Trail or continue to ride up Fountain Place Road to the Armstrong Pass Trail and the Armstrong Connector Trail. Let’s start with the easier ones. Corral is more technical, but an exhilarating downhill, while Sidewinder is smoother and snakes you through 47 bermed, hairpin turns. The turns are just within the level of challenge most riders feel comfortable with and are a total blast — although, I was wishing I had the better turning power of a smaller mountain-bike radius than my 29er. Whatever bike you have, you will yell, “Wee!” a number of times. 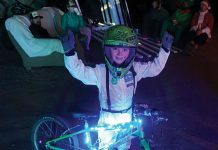 Once all the twisting and turning is done, in about 1 mile, both Corral and Sidewinder combine to give you a chance to fly off the flat jumps or roll through some big sweeping turns. Much too quickly (about 3 miles from the start), you run into the power-line dirt road where a left turn brings you back to where you parked. If you have the energy and time, do another lap because this entertaining jaunt took less than an hour. Besides, when you reach the bottom, you will be itching for more. Let’s go back and talk about the Armstrong Pass and Connector options. You can ride or drive to the top of Fountain Place Road. From there, the Armstrong Pass Trail goes straight ahead, quickly crossing Trout Creek, and the Armstrong Connector Trail takes a sharp left, paralleling the road back down to a junction with the Sidewinder and Corral trails. The Armstrong Trail is a 3.8-mile steady climb to Armstrong Pass. Some can ride it all; others will have to get off their bike in some of the rocky sections. Take on the steady climb 1,000 feet to the trail junction with the Tahoe Rim Trail (TRT). Enjoy views of Fountain Face and the ridgeline leading to Freel Peak to the east. On reaching the TRT, the truly adventurous can take it west 4.8 miles to the Saxon Creek Trail, where the 5.3-mile infamous Mr. Toad’s Wild Ride begins. Mr. Toad’s has some technical, rocky sections at the top and lots of smooth, fast rollers near the bottom. It’s recommended for experts only. If you ride the Armstrong Trail as an out and back, you will arrive back at the top of the road and have the opportunity to enjoy the 1.7-mile-long Armstrong Connector Trail. This fun downhill has awesome views of the lake and mountains. Watch for sandy hairpin turns and some rocky sections. However, in the blink of an eye, you will be ready for the excitement to be had on the Sidewinder Trail. I just scratched the surface of the South Shore’s network of trails, which has been expanding and improving over the last decade. 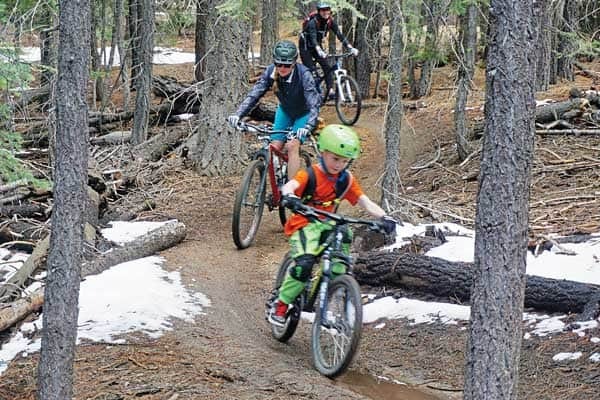 “In the past couple years, TAMBA, the Forest Service and volunteers have built and improved the trails. 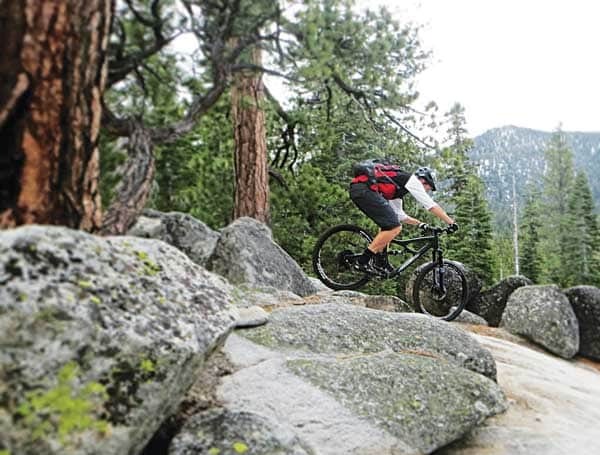 All the singletrack is pretty cool,” says Kent Wattanachinda from Watta Bike Lake Tahoe in Meyers. 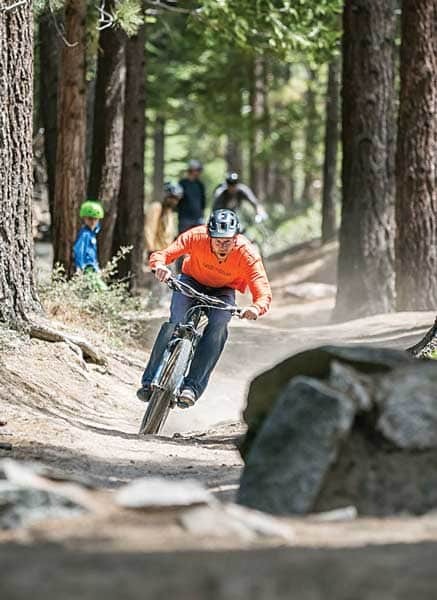 A word of caution: The lack of rain has made Tahoe area trails dusty and sandy. If we get a good rain, be sure and get out there ASAP because the trails will then become epic brown powder. For more information and maps, visit tamba.org. Tim wrote the official guidebook to the Tahoe Rim Trail, as well as “Monsters in the Woods: Backpacking with Children” and the children’s book “Gertrude’s Tahoe Adventures in Time.” Most of the year he writes on a variety of topics, but you will find him in the winter teaching cross-country skiing and running the Strider Gliders program at Tahoe Cross Country Ski Area. 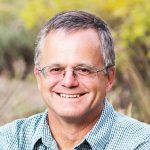 He has lived in Tahoe since he was a wee lad and loves to be outdoors road and mountain biking, hiking, paddleboarding, kayaking and cross-country skiing.